Good or bad, [tag]MySpace.com[/tag] is a worldwide phenomenon. Almost every single one of my college students have an account with them. Despite it’s huge success and technological prowess with bringing the world together, it’s visual impact is LESS THAN STUNNING. Quite simply, the default page choices are UGLY and BORING. 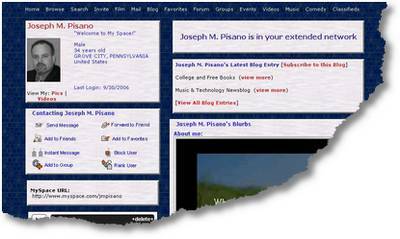 I’m not a big “MySpacer” or “MySpacie” (can I coin these terms?). I only recently opened a site with them. I was immediately shocked by the lack of themed options and difficulty posed by changing profile colors and text choices. Although, MySpace.com has options to change the look and design by adding your own CSS and HTML code, I would surmise that the majority of those using MySpace.com aren’t completely versed in this type of coding. Fortunately, there are a number of great [tag]MySpace[/tag].com editors available. You can use these types of editors to change the backgrounds, text colors, box options and overall look of a MySpace.com account. There are many of them available and endless results are returned if you Google “myspace.com editors”. I have poured over the [tag]Google[/tag] results and personally found two online Myspace.com editors to out shine the others. They are MyGen 2.5 and the MySpace [tag]editor[/tag] found at the picgames.com site. MyGen 2.5 is both easy to use and the interface looks great. It provides you with a preview window so that you can see the changes to a “stock” template as changes to the template are entered. It has a larger selection of text palettes and options than the other MySpace.com editor reviewed here. The Myspace.com editor found at picgames.com is also a very good editor. 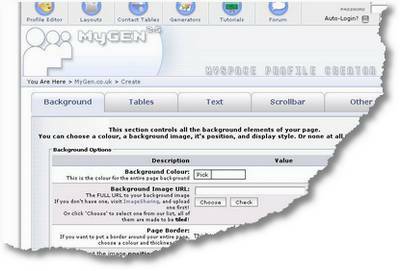 Although it doesn’t have all the text options that the MyGen 2.5 editor has, it has one very useful feature that will be a great consideration. The picgames.com editor has a “live preview” that will show the site to be changed. In this manner, as changes are made with the editor, the preview will show what the proposed effects will look like on the actual site. Both of the editors will generate the HTML & CSS codes you will need to insert into your MySpace.com account. This code will be entered into your “About Me” section of your profile. **You may want to copy the code that is already in the box before you change it. Simply copy & paste it into a text editor such as Notepad or Wordpad. Once you save the newly entered code you will be able to see the changes after you reload your MySpace.com page. Congratulations!